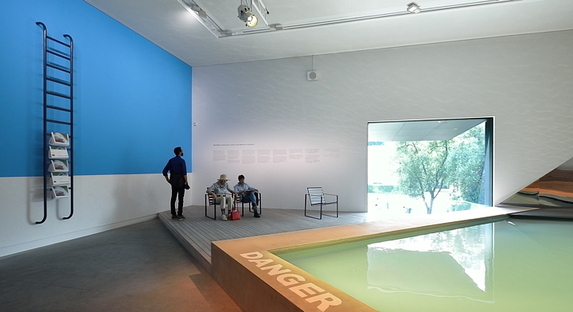 At the preview of the 15th International Architecture exhibition – La Biennale di Venezia we also visited the Australian pavilion whose theme is “The Pool: Architecture, Culture and Identity in Australia”. 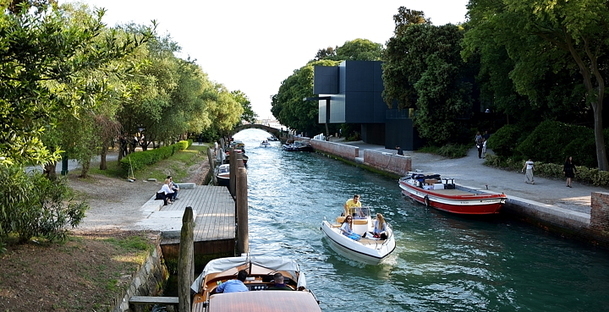 At the preview of the 15th International Architecture exhibition – La Biennale di Venezia we also visited the Australian pavilion whose theme is “The Pool: Architecture, Culture and Identity in Australia”. We were lucky enough to chat with Olympic swimming champion, Ian Thorpe. 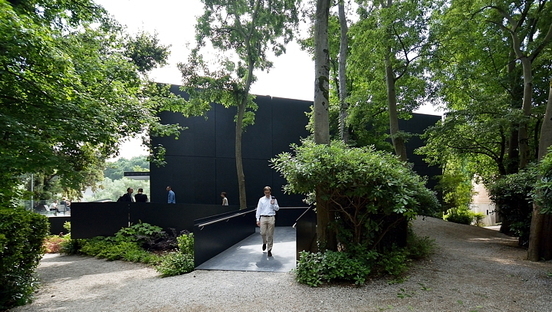 Discussing architecture with a sportsman like Ian Thorpe, Australian freestyle specialist and considered one of the best swimmers of all time could only happen at the Biennale, and more specifically at the Australian pavilion. 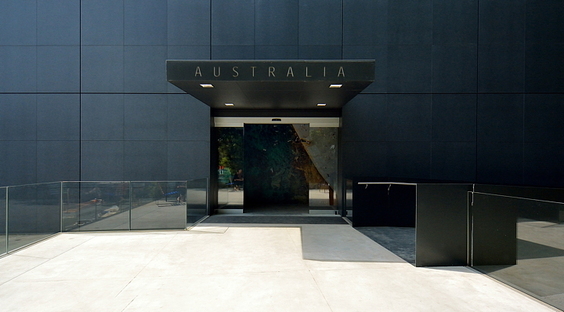 As we already mentioned in our article introducing Australia's contribution to the 15th International Architecture exhibition – La Biennale di Venezia (http://www.floornature.com/blog/2016-biennale-the-pool---australian-pavilion-11582/), the curators Isabelle Toland and Amelia Holliday from Aileen Sage Architects with Michelle Tabet use the pool as the linchpin of their narration from the front, where the pool is part of the Aussie “way of life” and turns into a driver of interaction and human relations. And then there is Ian Thorpe, who is also here because he contributed to the book accompanying the pavilion, which is a collection of stories by Australian greats, also all about pools - natural as well as manmade. We asked Ian Thorpe about the importance of pool architecture for swimmers, in other words for someone like Ian who basically lives in them from training through to races. Ian Thorpe explained that it is essential for the energy of the spectators to focus on the pool. Swimmers need the energy that the public feeds them, they need to be carried along by the spectators in order to do their best; this poses a real challenge to architects, particularly in large facilities where the architectural design can affect the success of the swimmers. Every pool is different, and even the water is never the same. Water is a vital, ancient element and the water we are swimming in now could be hundreds of thousands of years old - it's an ongoing fusion of eras, people and places. Ian Thorpe tells us that if you're swimming in a pool, you are immediately aware of other people entering, even if they're nowhere near you. The vibrations, the energies, the moods - everything feels much different in the water, and this affects the swimmer...a bit like we are all influenced by the buildings around us. Something we often don't notice, although it's there and it leaves its mark. Ian grinned when he mentioned “the mark” we leave on the water when we swim, we need to collaborate with the water in the search for the perfect movement, to accommodate it rather than resist it. A very subtle concept that brings to mind how right the ancient Greeks were with their “Panta Rhei” - everything flows - or “no man ever steps in the same river twice, for it's not the same river and he's not the same man”. Swimming, as Ian Thorpe explains, is a sport born from the need for survival - it's swim or sink. You have to work with this unique environment if you want to stay afloat. 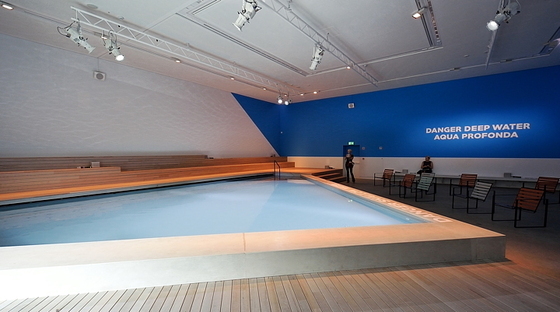 A perfect metaphor that goes way past the mere architectural function of the pool, and even beyond its role as a place where people can get together, a place to share experiences. If we used the energies all around us to learn to “swim” in our lives, we would definitely be better off and we could go with the flow and adapt to the changes that life throws at us, drawing strength and benefiting from the flow of life. 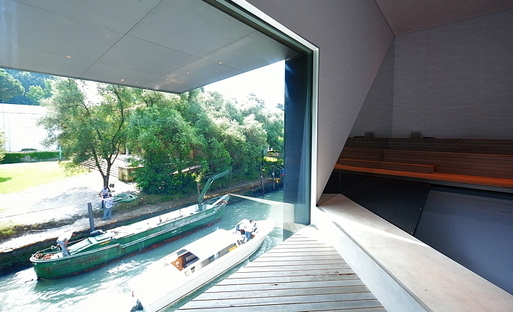 Sitting in the Australia pavilion overlooking the large pool in an open space with views of the Biennale Giardini and canal and chatting to Ian Thorpe about his idea of architecture was without any shadow of a doubt one of the highlights of our participation in the preview of the 2016 Biennale. Thorpe's experience as a sportsman broadens the whole concept of architecture and makes it more accessible to everyone - that's the real front, the really significant front in 2016!